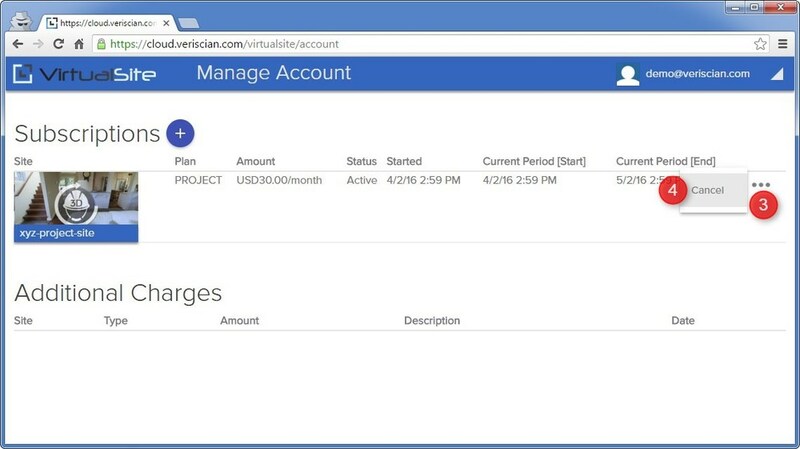 1) Login and navigate to your account settings at https://cloud.veriscian.com/virtualsite/account. You can also navigate to this page by selecting the drop down menu at the top right of the screen and choosing "Manage Account". 2) Any active subscriptions will be displayed in the list under the "Subscriptions" sub heading. 3) Find the active subscription you wish to cancel and select the "More options" button (three dots icon) to reveal a menu. 4) Within the menu, select cancel. 5) A dialog box will appear asking to confirm whether you wish to cancel the subscription. Cancelling a subscription will mean that the site will no longer be accessible by users, with any associate settings, files and content deleted within a 24hr period. 6) If you wish to abort cancelling the subscription, you can select the "Go Back" button, otherwise select "Proceed" to finalize the cancellation of the subscription and deletion of the site. 7) Once a subscription has been cancelled, it will disappear from your list of active subscriptions and you will incur no further monthly charges. Please note, this will not impact any other active subscriptions you may have. Any other active subscriptions will continue to run unless individually cancelled using the above steps.